The tiny community of Valleyford has a story like many of the small towns of the Palouse. 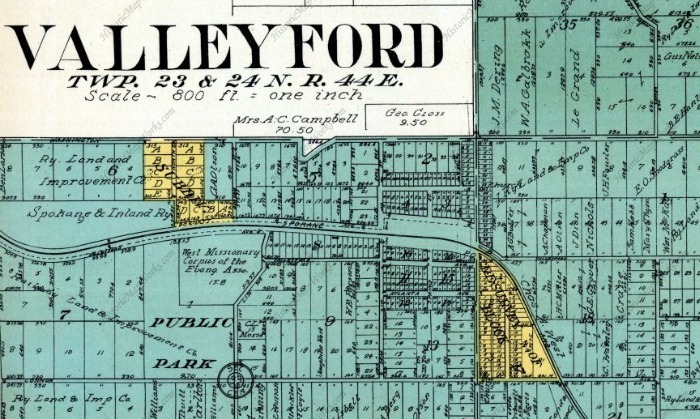 The area was first settled in the 1880s, and Valleyford was incorporated in 1906. The town enjoyed some decades of prosperity and growth before a combination of changing agricultural practices, new patterns of transportation, and the Great Depression took much of the life out of the town. If you look around, however, there are many signs of history to be discovered here. The Valleyford area was known to the Coeur D'Alene and other Indians as a rich region for harvesting camas. Valleyford was settled in the 1880s, and like much of this region of the Palouse was known for its fruit orchards and wheat farms. By the early 1900s Valleyford was a thriving community with a bakery, train station, barber and butcher shops, a bank, a law office, a dance pavilion, a newspaper, a high school and not one but two hotels. Much of the Valleyford's early success came with the arrival of the Inland Empire Electric Railroad in 1907. The "Bug" as it was sometimes called linked the town to Spokane as well as to the other small towns of the Palouse. Electricity arrived with the railroad as well, and for years Valleyford was wired to the same circuits used by the railroad. "When the trains turned on the power to leave the station, the town's lights would dim," one resident recalled. A 1912 map shows the ambition of the founders, with the town platted for further growth that never occurred. Falling farm prices and increased mechanization began to erode the town in the 1920s. The Great Depression hit Valleyford especially hard, permanently closing the Community State Bank and many other businesses. The high school closed a few years later, and by the 1960s the town disincorporated. An interesting walking tour of Valleyford is available in a pamphlet that can be purchased at On Sacred Grounds coffee shop. 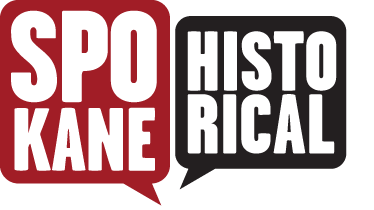 A stroll around town will reveal concrete hitching posts from the 1880s, the old mercantile store, a 1916 community building, and more. 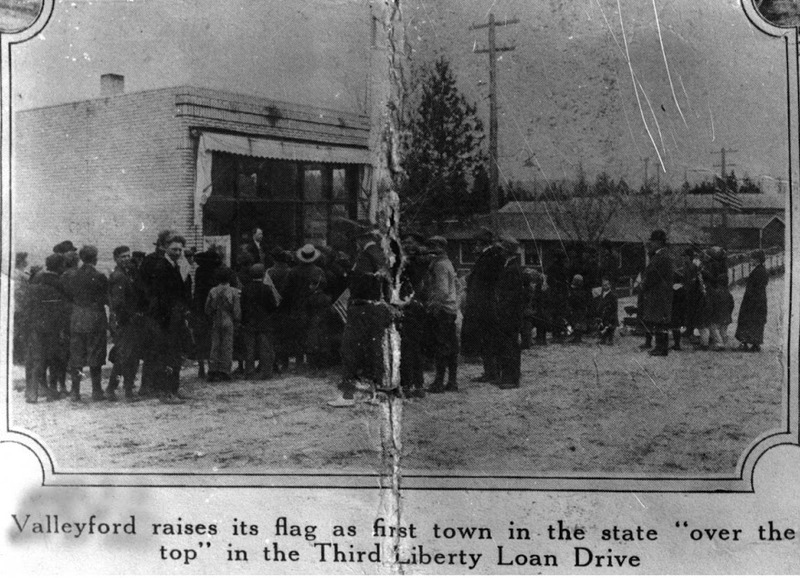 Third Liberty Loan Drive: In 1918 Valleyford residents gather to celebrate meeting the community's goals in the Third Liberty Loan Drive, an effort to get American's to buy war bonds for the First World War. Image courtesy On Sacred Grounds coffee shop. 1912 Plat Map: This 1912 plat map captures Valleyford as it imagined itself. Many of the lots pictured here never did fill in with houses and the town peaked within a decade. Image courtesy Washington State Archives, Eastern Region Branch. 1918 Influenza: The nationwide 1918 epidemic of influenza did not spare the little town of Valleyford, as revealed in this clipping from an Everett, Washington newspaper. Image courtesy of Washington State University. 1907 Real Estate Ad: "The Man Who Knows Buys at Valleyford" according to this 1907 full page advertisement in the Spokesman-Review. 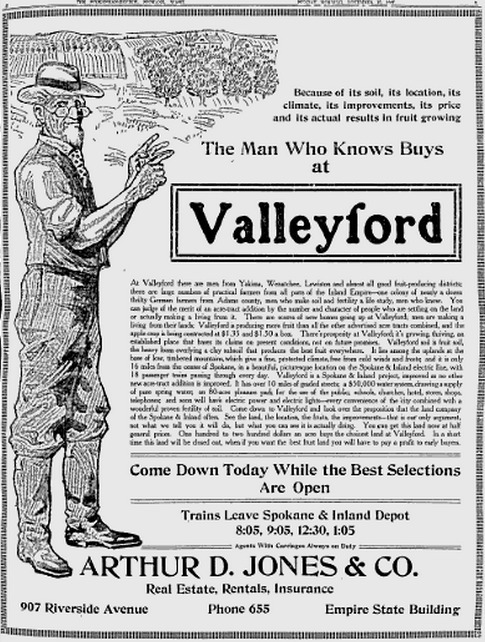 Real estate agent Arthur D. Jones & Co. boast of Valleyford's excellence as an apple-growing region which produces "the best fruit anywhere." Image courtesy the Google News Archive. Larry Cebula, “Rise and Fall of Valleyford,” Spokane Historical, accessed April 20, 2019, https://spokanehistorical.org/items/show/510. Stefanie Pettit, "Strolling through History," Spokesman-Review July 22, 2010. Valleyford Historical Club, "A Walking Tour of Old Valleyford," 2010.